Konstantin Korovin is a Russian artist, an advocate and impressionist. He studied with not the most famous artists, and left the Academy of Arts after three months, being dissatisfied with the quality and methods of teaching there. He was not so talented as to call him a genius – much better than the technical side of the question, did he manage to get ideas. Inherent in him was the ability to subtly and deftly catch the mood, to transfer it to paper. Contemporaries who knew him and his brother – who was also an artist – usually noted that Konstantin lacked skill and talent, and his brother lacked ideas, although he draws much better. 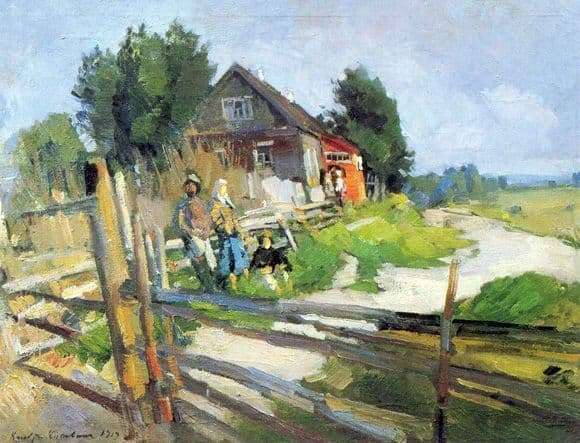 “Landscape with a hedge” is somewhat clumsy even for Korovin. Having set a goal – to convey the mood of the summer day, to grab the feeling of country life like a feather in the air, he became interested in achieving it, not thinking about how technical the resulting picture would be. On it is a village street, the viewer seems to be looking at it from the yard, because of a crooked hedge. Nearby, three people are talking to each other, whose faces are not even marked with strokes, there are two more people in the distance, standing on the porch. Rye grows on the field. The street flows into the road and leads to a distant grove, where the village must gather mushrooms and berries. And despite this – the obvious flaws, carelessness and almost untidiness, the picture is full of life. The sky glows bluish, on the way you want to go, and so good to remember the village days, warm, weeping, filled with routine simple deeds, when life seems quite simple and understandable from the inside.